It is the understanding that success in a consulting business takes more than one simple marketing tactic, or that sales are easy. It is the recognition that marketing and sales are nothing without effective and efficient project delivery. And that you cannot scale a consulting business without having each of those elements in place first. However, the term ‘consulting’ is incredibly ambiguous, with many people using the terms ‘coach’ and ‘consultant’ interchangeably. As someone who runs both a coaching business and a consulting business, I do not agree with this perspective at all. Whilst a coach might undertake activities that are similar to what a consultant might do, and vice versa, a coaching business is very different to a consulting business. It is for this reason that I created this manifesto. 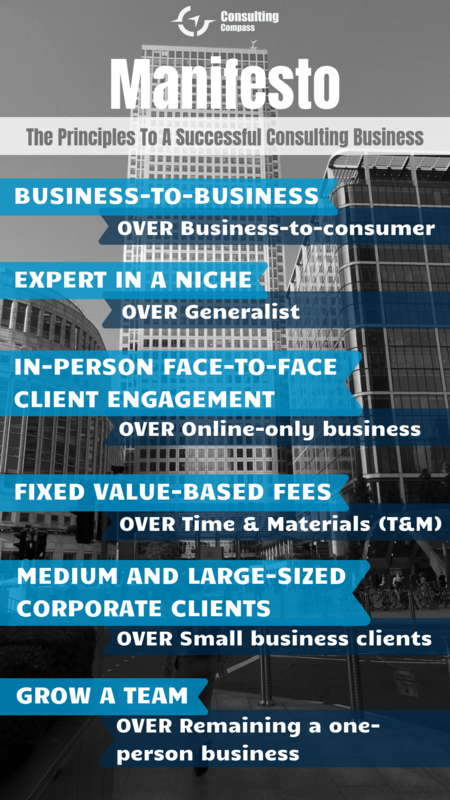 To create absolute clarity as to what Consulting Compass stands for. If the manifesto below sounds like you now, or it sounds like where you want to get your business to, then you are in the right place. If it doesn’t describe you and your business, or your business aims, then this website and its content is not for you. Whilst there is value in the items on the right, this website, our blog articles and resources, the Consulting Compass, and our coaching is focused solely on the items on the left.